Blue Roses appear throughout history in art, literature and in one iconic 1978 concert poster, as a symbol of love, hope and faith. But, in real life blue roses don’t actually exist. Genetically no one has managed to crack the code and produce a true blue rose, or have they? On Febuary 8, 2014, our community lost a great friend in Joe Capone. For those of us lucky enough to have known Joe, we had an authentic blue rose in our midst. Joe was that guy that knew how good life was and reminded you often. Anytime you asked Joe how he was doing his answer was always, simply “living the dream…”. He knew how precious life was and he embraced it. 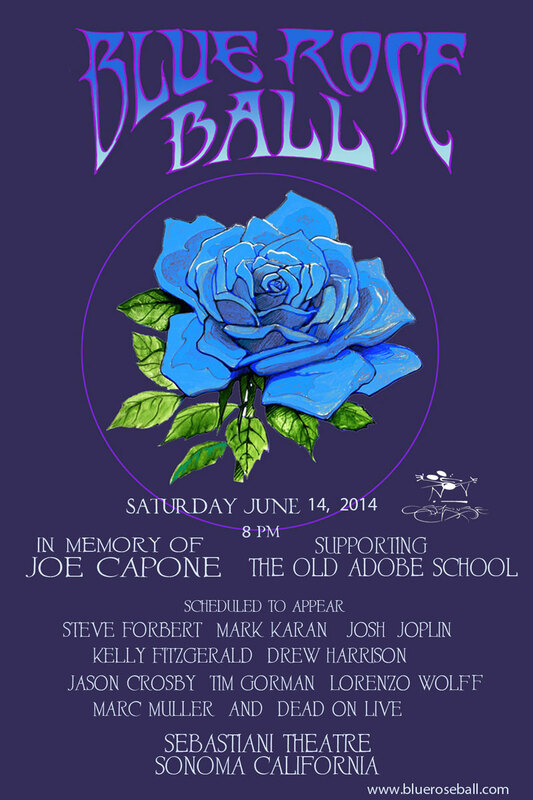 To honor Joe’s life, incredibly well-lived and chock full of love and giving back, we’re assembling some amazing musical talent for the inaugural Blue Rose Ball where we’ll rock and roll and celebrate Joe’s passion for life and music. We’ll also do some real good for the community and raise money to help give more children a chance to get a jump-start on a great education by introducing the Joseph Capone Scholarship Fund at the Old Adobe School in Sonoma, California. If you’re unable to attend, please consider making a tax-deductible donation to the Joseph Capone Scholarship Fund at the Old Adobe School in Sonoma. The preschool focuses on quality early childhood education with emphasis on diverse cultures and the arts. Complete and up to date information at blueroseball.com. Russ Brown liked this on Facebook. Brad Kelly liked this on Facebook. Steve Walters liked this on Facebook. I would hope the poster would be available for purchase. Bill McClellan liked this on Facebook. Ray Mcd liked this on Facebook. Wish I could be there. I’ve met Stanley several times. He’s so kind and gracious. He signed my Mars Hotel promo poster. Dave Gorden liked this on Facebook. Fügen Gülsen liked this on Facebook. Bryce Hall liked this on Facebook. Gary Frutkoff liked this on Facebook.